This extremely transparent book gives you a front row seat to watch a real God transform a real problem into something beautiful--something impossible. A dead marriage on the brink of divorce was all but over. Then there's that moment. That moment where you can make a permanent decision or trust God and persevere. Here is a story of what happens when you go beyond that moment--that divorce worthy moment and reach the place you've longed for but never thought was possible. There lies the hope, peace and unconditional love found only by being in God's will. 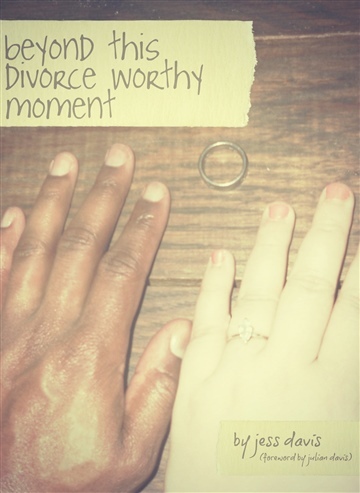 When marital success is determined by happiness rather than holiness, divorce is imminent. This couple's true story reminds us that there has never been a Christ-centered marriage that has failed. Author/speaker Jessica Davis is a wife and mother of 2 boys. Having gone through some of the lowest and most unfortunate times in her life, she is able to articulate her experiences in a way that brings humor, hope and application for change. Her writing style makes the content extremely easy for readers to digest while pointing to the only source for true healing and peace--Jesus Christ. "Already read the new book. Exceptional regardless of how long you've been married. Will definitely read it again with a highlighter in hand. You are so gifted Jess!" "Perfect. Seriously it was great. Clearly I couldn't stop reading it." "Very transparent. I absolutely loved it. I laughed and I cried. I could not stop reading it." It's something I'm sure a lot of other women have gone through and I'm sure it will help them. For people who are unsure of their faith it can make their relationship with God stronger. "It is definitely the kind you don't want to put down. The scripture references are excellent. It shows the hopelessness, the giving up, the lies people tell thinking it's for your own good-- but how only God could have mended this broken marriage. I also like the way you point out the growth and change. It's a very good book. There's just no place you want to stop and put it down and pick up later."